As climate change leads to an increase in wildfire evacuations, a recent study indicates more has to be done to ease the impact on Indigenous evacuees. With 60 per cent of First Nations located within or intersecting with wildland, band councils and non-Indigenous communities need to get prepared, said Tara McGee, associate chair undergraduate in the Earth and Atmospheric Sciences department at the University of Alberta. For some First Nations people, the first time they leave their isolated community is when they are forced out of their homes by wildfire, she said. Coupled with that trauma is having to seek refuge in a non-Indigenous community, unfamiliar with their culture or language. McGee would like to see other evacuation options put into place. If it’s safe, temporarily re-locate First Nation members to other First Nations communities or allow them to seek refuge on their traditional land. If neither of those options is possible, then she would like to see non-Indigenous communities adopt measures that respond to the needs of First Nations evacuees. 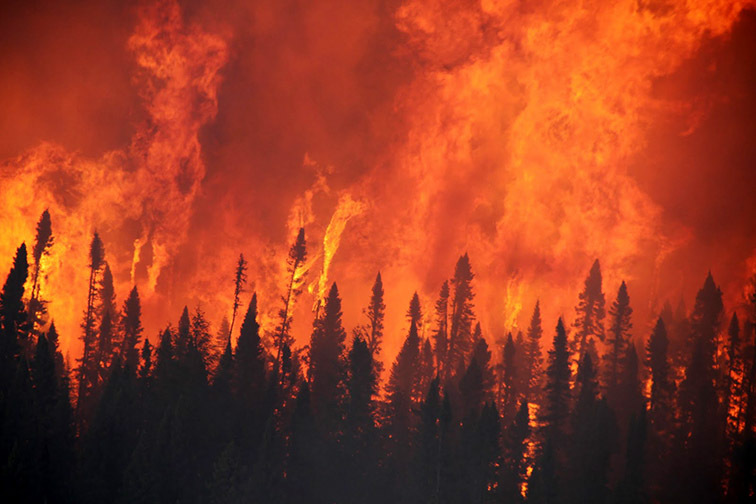 McGee was drawn to study the response of First Nations people to mandatory evacuation orders when, in 2011, numerous reserves in Alberta, Saskatchewan and Ontario were evacuated due to wildfires. The study focused on the Mishkeegogamang Ojibway Nation in northwestern Ontario. In June 2011, a full evacuation order was given due to heavy smoke from and proximity to the Sioux Lookout fire. The population, approximately 1,000 members, were evacuated on three different days to three different locations, including Sioux Lookout. Some members went willingly, while others had to be coaxed by friends or escorted by law enforcement. In speaking with 28 evacuees three years later, a number of concerns were voiced as to why they didn’t want to leave their homes. Some of those reasons were similar to those of non-Indigenous evacuees: They didn’t perceive a risk or they were worried about their belongings. But there were also unique reasons offered. “People wanted to have the freedom to carry out their usual activities, including hunting and fishing. So that’s something non-Indigenous people wouldn’t have a similar experience. “Essentially with the evacuations, typically, everyone is transported to a town or city so taking an Indigenous population away from their territory means they can’t carry out their normal activities, which is quite different to a non- Indigenous population,” said McGee, who admitted there was nothing in the findings that surprised her. The next step, she says, is to make the experience of wildfire evacuation less traumatic. “In terms of reducing negative impacts on First Nations people, depending on the fire, could people stay within their traditional territory if they have the resources and knowledge to do that safely?” she said. Staying within their traditional territory would mean they could hunt and fish. Band councils could play a role in helping to create designated safe havens in traditional territory. “Communities may want to have a discussion about whether that’s something they feel they could do,” said McGee. Evacuating to another Indigenous community is also an option, she said. “But the last thing you want to do is send them somewhere and then have them need to leave again, which occasionally happens,” said McGee. But if First Nations people have to go to a non-Indigenous community, appropriate cultural resources must be made available including accommodations that take into consideration large family sizes; translators; and traditional foods. “There’s much more of a need for host communities to have a better understanding of the communities having to evacuate there,” said McGee, admitting that comes with experience. For a community like Sioux Lookout, which is a common evacuation centre, having a plan in place to care for First Nations evacuees should be a priority, especially when wildfire evacuations leave little time for preparation. “Having strong links with the First Nations, just having good communication, would help,” said McGee. While this study focused on how First Nations responded to a wildfire evacuation notice, McGee says she hopes a future study will allow her to look at the host communities. “Experiences in host communities played a very key role in influencing (the evacuees) experiences,” she said. McGee’s study, “Residents’ wildfire evacuation actions in Mishkeegogamang Ojibway Nation, Ontario, Canada,” was recently published in the International Journal of Disaster Risk Reduction journal.